For more information, check out my post How to Make Jam from Frozen Fruit. My friend Audrey gave me frozen peaches when she cleaned out her freezer and moved to Massachusetts. 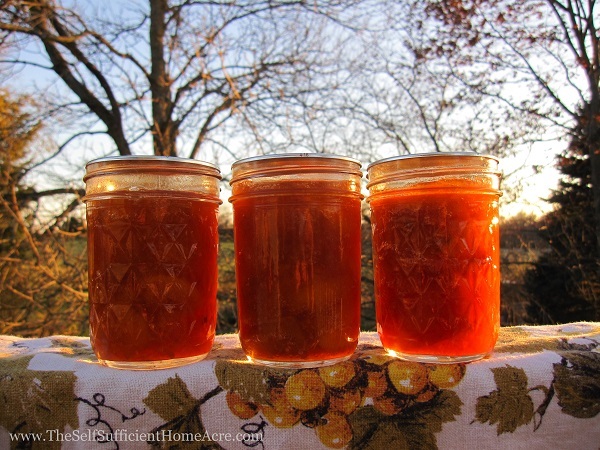 I made peach jam to send along with her, give to our friends, and to spread on our toast. We should be pretty well set for jam and preserves this winter. I used a reduced sugar recipe so the jam wouldn’t be overly sweet. It is still sweeter than it needs to be. I followed the recipe for cooked jam on the instructions that came with the Sure Jell No Sugar Needed pectin. 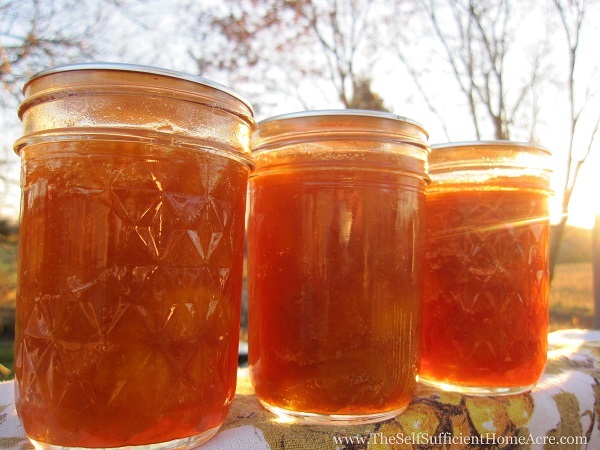 I also make peach jam from fresh peaches…here’s how! 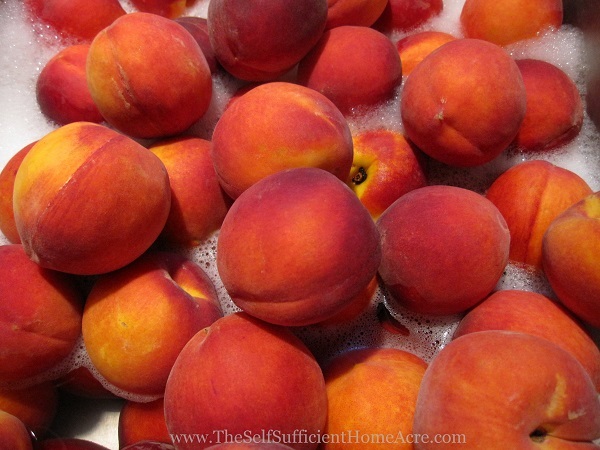 Wash the peaches to remove pesticide residue. 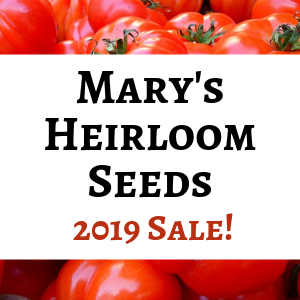 Before you begin preparing your fruit, assemble all of your materials, fill your hot water bath canner (about 3/4 full) and begin heating water. Wash and sterilize jelly jars and screw bands. Place metal lids in very hot water until ready to use. Prepare fruit while you wait for water to heat up. When water is ready to boil, begin cooking your jam. 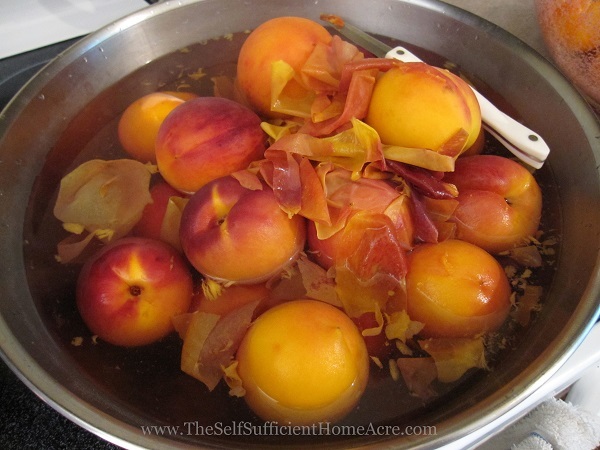 Peeling peaches is usually easy if you dunk them in boiling water, then in cold water. The skins should pull right off. Peel the peaches by dipping in boiling water, then ice water. The skins will slip right off (unless the fruit was picked when green). Pit and chop peaches. Peeled, chopped, and ready to make jam. 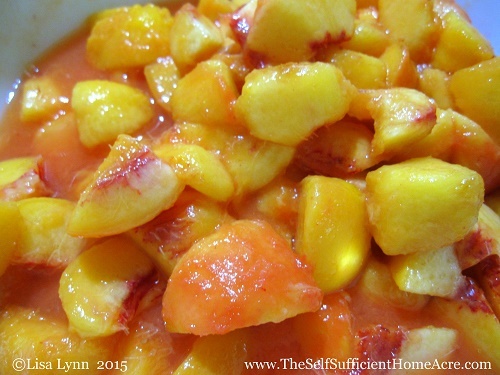 Measure chopped peaches into a 6-8 quart stainless steel sauce pan. Add lemon juice. Measure sugar into a separate bowl. Take 1/4 cup of the sugar and place in a small bowl with the pectin. Mix thoroughly then add to the fruit in sauce pan and turn heat to medium high. (You may add a small pat of butter or margarine at this point to reduce foaming). Stir mixture constantly to prevent scorching. When fruit reaches a full rolling boil, add the remaining sugar all at once and stir. Keep stirring. When fruit returns to a full rolling boil, begin timing. Cook for 1 minute, remove from heat. Skim foam. Ladle jam into sterile jelly jars, leaving 1/8″ of head space. Wipe top of jars with a clean, damp cloth and place hot lid on jar. Screw metal band on finger tight. Use a jar lifter to place jars carefully into boiling water bath. Process for 10 minutes at elevations of 1000 ft or lower, 15 minutes for 1001-6000 ft, and 20 minutes for elevations over 6000 ft. Begin timing when water returns to a full rolling boil. Lift jars out of boiling water with jar lifter and place on a heavy cloth to cool. When lids seal, they will make a pinging sound and will not move up and down when you press down on them. Any jars that are not sealed can be cleaned and processed again or refrigerated and used in the next week or two. Have you ever made jam from frozen fruit? I love to hear about your experiences! Homemade Peach Jam sounds really good right!! I don’t make my own jam but there is nothing like homemade jam!! Have a wonderful day! Well my guys sure snarf it up fast! If you ever get the urge, try making a batch of freezer jam…no canning necessary!